When going downhill on mountain roads with no dedicated cycle path, it happens quite often that the cyclist becomes the head of a train of vehicles, as the winding road does not allow an easy and safe take over. In such situation, I personally feel much safer if I can stop and let the train pass by (even though the drivers are not putting pressure, the idea of losing control of the bike while moving at 50-60 km/h with a lot of vehicles behind me is kind of scary). I therefore search for a suitable place to stop like a parking area on the shoulder and when I find it I come to a stop there. What I normally do to convey the cars behind me that I am scanning the road for a place to stop is to sit with my torso straight on the saddle, and then raise my hand before signaling I am moving to the side. I am not sure this is easily understood by drivers, so my question is: is there a codified gesture for conveying the message: "I am looking for a place to stop?" This question came to my mind after taking a two-way mountain road, with speed limit at 50 km/h and where my travelling speed was ranging between 30 and 50ish km/h. I have this same problem on a couple of local descents. There isn't signal that communicates what you want to say, clearly and succinctly. Anything you try and do will take at least a hand off the bars and reduce your overall stability at speed. What you can do is stop pedalling, and pull to the side of the road so there is as much space available for the vehicle to pass. THEN its up to the driver of the vehicle to decide if its safe to pass or not. A car will need some hundreds of metres of clear space if they have to cross the centerline so don't bother if you're anywhere near an upcoming corner. In fact if you're getting close to a corner, its sometimes better to clearly take the lane by shoulder-checking and then moving into the lane. This stops anyone from passing you in a dangerous way. If I absolutely needed to show I was slowing to allow a pass, I'd probably do something like pull to the side as far as possible, maybe unclip my outside pedal and have both legs straight down. If the shoulder was wide enough I would be very much off the roadway. Downside is most hillsides lack in road shoulders so there's not a lot of space. You can also try to look at the following driver and establish an eye contact - but they might think you're simply challenging them or something. Lastly, another physical way to show you're stopping is to straighten your arms, lower your torso, and get off the saddle. This will put your backside backward, and is a pretty clear indication that you're braking hard. Mostly visible to other riders, someone in a car might not perceive it as clearly. In some places, the painted centerline may stop the vehicle from being allowed to pass, so you might be wasting your time if the road is narrow. Your other options are to get going faster, or to time your descent so it starts at the end of a car column with a space behind you. This can be aggravating if the line of cars is slower than your descent. At all times be safe on a descent. Don't feel you have to push and outride your comfort zone/speed. There's a lot of kinetic energy when descending, and if that transforms into friction or a sudden stop, then its a bad day. I take a different approach to @Criggie, as many of the roads I ride are potholed, narrow, and/or winding. On descents I stay wide and take the lane -- I can see hazards ahead (and also be seen better). If I decide to look for somewhere to pull in, I sit up, stop pedalling and start scanning (with head, not just eye movements). Then when I do see somewhere to pull in, I give a slowing signal (scroll down) on the left (we drive on the left in the UK). Strictly speaking a slowing signal should be given on the right, but that looks too much like a right turn signal given that most drivers don't seem to have much of a clue about arm signals; it also occupies the primary braking hand. Because I was in the middle of the lane (or the middle of the road if single track) to start with, my lane positioning gives a further clue to those behind that I'm pulling in -- it's not just a little wiggle like going round debris, I move half a lane to the side. I also unclip even if I don't intend to completely stop, but I tend to unclip in plenty of time as a precaution. I'm reluctant to wave cars past, except when at the back of a group and relaying signal from further ahead. Drivers are too unpredictable to make judgement calls for them (there are plenty that are slower than you'd think), and I often don't have that much more line of sight than they do. However once I've pulled in to let them pass, I often wave them on. 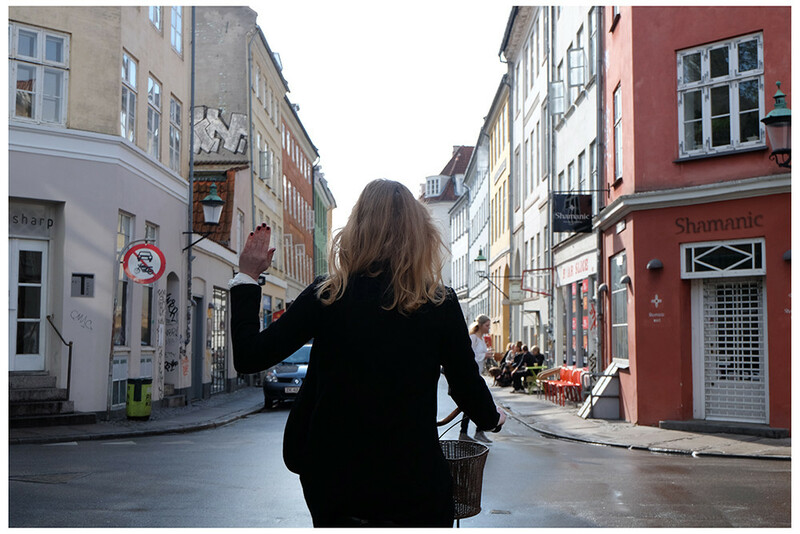 In Denmark, raising your hand next to you shoulder is the accepted bike signal that you're going to stop. Not sure if all drivers will understand, and as there are no hills in Denmark I have no idea how this would work on a descent at high speeds, but it is a pretty effective signal. To me it is completely new, but objectively it makes sense. Not the answer you're looking for? Browse other questions tagged safety signals or ask your own question. Is using hand signals a legal requirement in the UK? 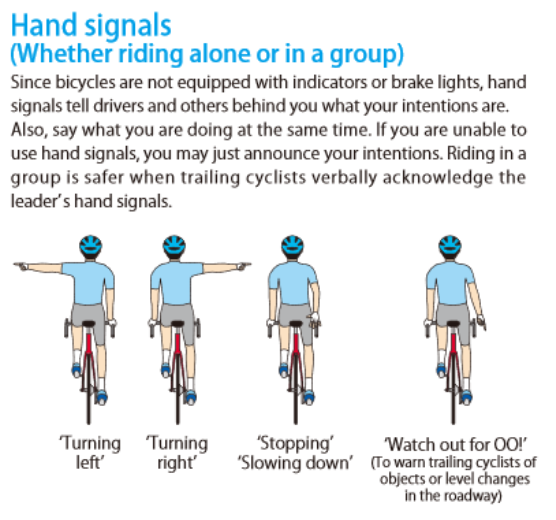 What hand signals work best for cyclists in the US? What is the hand gesture for “I'm sorry”? How to proceed when pedestrians occupy the dedicated bike path? Is it really safer to ride in the road than on the sidewalk?